The researchers are all part the joint biomedical engineering program at North Carolina State University and the University of North Carolina at Chapel Hill. To make the “nanodaisies,” the researchers begin with a solution that contains a polymer called polyethylene glycol (PEG). The PEG forms long strands that have much shorter strands branching off to either side. Researchers directly link the anti-cancer drug camptothecin (CPT) onto the shorter strands and introduce the anti-cancer drug doxorubicin (Dox) into the solution. be injected into a cancer patient. 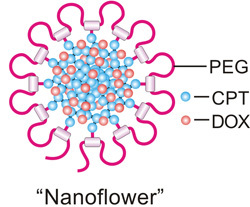 The paper, “Folding Graft Copolymer with Pedant Drug Segment for Co-Delivery of Anticancer Drugs,” is published online in the journal Biomaterials. Co-authors include Dr. Ran Mo, a current postdoctoral researcher in the program, and Yue Lu and Tianyue Jiang, who are both Ph.D. students in the program. The research was supported by the National Institutes of Health under grant 1UL1TR001111 and funding from NC State and UNC-Chapel Hill.